We’ll be the first to admit that 90s kids were pretty tough for having survived endless numbers of trampoline spills. Thankfully, gone are the days of rusty springs, breaking mesh, and faulty trampolines—it’s a different day and age in the world of trampolines. As parents today, we’re more than willing to put in the research needed to explore additional safety precautions; especially because it gives us a better chance to ensure our kids aren’t harmed while they’re outside trying to get some exercise and have some fun. And with the amount of information you can find on search engines, there’s no excuse for having an angry, rusty, old tumbler in your backyard. Indeed, the trampolines of the past are well behind us now. And we’re pretty glad about that. 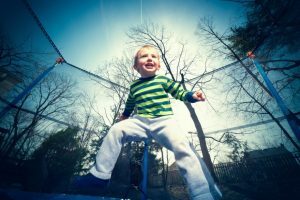 The first and most obvious thing to look out for when trampoline hunting is a strong safety net that protects kids from falling off or impacting the frame or springs. You will need a net designed to be used in tandem with the trampoline. We don’t suggest recycling nets from a friend’s old trampoline or buying from a separate manufacturer than the maker of the trampoline you purchased. Matching them up ensures that you’ll have a calculated fit. It goes without saying, too, that if you really want to ensure a trampoline safety net is well-built, buy from the company that invented the safety net in 1996. (Before you Google it, we have a spoiler alert: it’s us!). Has your trampoline been tested? Next, you want to make sure that net has been tested for performance and safety. Our nets are sturdy enough to withstand various climates, they are UV-resistant so that they’ll last for years, and we assure that they can take thousands of impacts without losing their integrity. Finally, you will want to take note of the shock-absorbing jumping surface of the trampoline—like the surface of all of our trampolines at JumpSport! Our numerous patents on bed and spring system enable us to design a trampoline with a more forgiving jumping surface. That means it’ll minimize the level of forces on the jumper, while still allowing for a smooth and lively bounce. And that’s important. After all, that’s all the kids care about, anyway. We think it’s time to invest in a top quality trampoline and safety net that was built with your child’s protection in mind. Check out our wide selection of backyard trampolines and nets today!